The chances are very high that like me, most readers of this blog know very little about Yemen. All I ever knew about Yemen is that it used to be divided into “socialist” and non-socialist spheres, that it reunited in 1991, that it’s reputed to be one of many Middle Eastern sites of terrorism, and that it sort of went through an Arab spring in 2011. 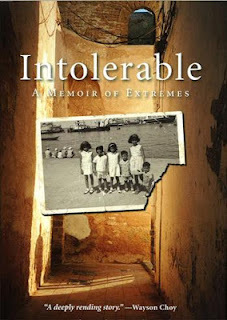 You can rectify this a little bit if you read Kamal Al-Solaylee’s Intolerable: A Memoir of Extremes, published in 2012 by HarperCollins. Kamal is a Canadian citizen who was born in Yemen and grew up as the youngest child in a huge Yemeni family (11 siblings in total: seven girls and four boys) in Aden, Beirut, Cairo and Sana’a, the first and last cities in Yemen. He came to Canada in 1996, as a highly qualified immigrant with a Ph.D. in English from Nottingham University. Kamal managed to very quickly work his way up through various odd jobs in the arts and journalism to a full-time job at the Toronto newspaper, the Globe and Mail; later, he became a professor of journalism at Ryerson University in Toronto, a position he holds today. Here is a picture of Kamal from his Ryerson University Website. Kamal is gay. Part of the book (cover depcted at left) is about his coming out, in a society is which homosexuality is deeply frowned upon. As he writes about his mother and seven older sisters, you wonder if they knew he was gay or whether they just knew he was different; not that many little boys, for example, want to go fashion shopping with their sisters, let along sit around with fashion magazines ahead of time picking outfits they think their sisters should wear. Perhaps his sisters knew but didn’t know, as to admit he was gay in conservative Arab society might be unthinkable. In any event, Kamal spent his adolescence in Cairo but did not know how to connect with the gay scene there until he visited one of his sisters in England and called a gay hotline for advice on where to meet other gays when he returned to Egypt. For a couple of years he enjoyed the gay scene but then his father, unable to make a living in Cairo, relocated the family back to the city of Sana’a in Yemen. Kamal had no choice but to go along, even though Yemen is a country where gays can be publically flogged or even hanged. He doesn’t say much about fear of exposure in Yemen, but if you think about it, the pressure must have been unbearable. Indeed, his old-fashioned mother encouraged him to “escape” when he received a scholarship to England, so maybe she did –sort of—know the danger he was in, even if she couldn’t admit it to herself. The fact that he is gay is probably one reason why Kamal is so sympathetic to his sisters. When they lived in Cairo, the whole family would go to the beach and the girls would wear bikinis. Later on though, as the Muslim Brotherhood gained strength in Egypt, Kamal’s oldest brother because very religious, far more so than their secular, anglophile father, who had owned real estate in Aden before it went socialist. The brother put more and more pressure on the sisters to conform to Islamic dress and codes of modesty. Once they returned to Yemen, the sisters had no choice to conform and gradually, as their options for independent living narrowed, they voluntarily turned to Islam for comfort. I was interested most in what Kamal wrote about being gay, and about his mother and sisters. But the book also conveys a sense of what life was like for prosperous and secular Arabs during the years he grew up. Kamal and his sisters attended Catholic schools: this was not a problem, as the most important thing was to get a good education. His oldest sisters had good jobs; no one said women should not earn money. The family was close-knit and unmarried brothers and sisters all lived at home with the parents. The book also conveys a sense of what it’s like to live in a state of warfare. The Al-Solaylee family left Beirut for Cairo when they couldn’t stand Lebanon’s civil war any longer. Then in Yemen in 2011, they encountered warfare again, as they lived through bombing raids. Electricity was rationed, gas and fuel were scarce, and people moved from the central city to the suburbs to avoid being bombed. However much we read about, it’s hard for us in Canada who have never experienced war (I never have) to grasp the day-to-day troubles, even if everyone in your family stays alive. Kamal Al-Solaylee’s book is a good way to learn about real life in the Arab Middle East.